Exploring the birth period of Islam, this talk focuses on one of the most prominent & respected Muslim women in history, Khadija, the wife of the Prophet Muhammad. Addressing her devotion and leadership roles in Mecca, this talk shines light on a figure who is an inspiration to men & women, both Muslim and non-Muslim alike. Moulana MS Abdul Qaiyoom is Chief Imam and Khatib for Masjid Bencoolen since 2006. He was an Imam and Khatib for Jamia Masjid in Chennai, India from 1994 to 2006. 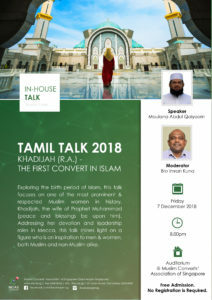 Graduated with Bachelor in Arabic from Madras University and Degree in Islamic Sciences & Arabic Language from Madrasah Jamia Al Baqiyahus Salihaath in India, Moulana Abdul Qaiyoom is fluent in 4 languages, Tamil, Urdu, Arabic and English.